Saturday morning I was running along Forsyth near Big Bend on my way to photograph a soon to be demolished circa 1970 bank building in Clayton when I looked north and realized that Washington University's historic Francis Gymnasium has been largely been demolished. The east block of the building fronted by the twin towers and main entrance is being retained and will be renovated. The complete removal of the roof, exposing the structural frame, is indication that the interior of the remaining portion will be greatly altered. 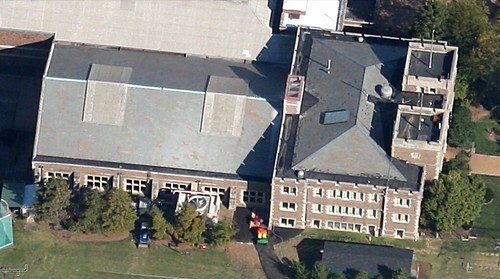 An aerial view of the historic gymnasium complex prior to demolition of the gym. A rendering of the expanded & renovated complex with a new south addition. 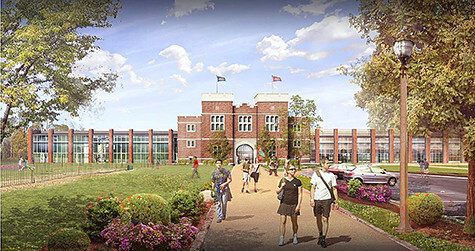 The demolition of Francis Gymnasium took me by surprise since I had seen this rendering last year that shows the historic gym renovated a a new fitness center. 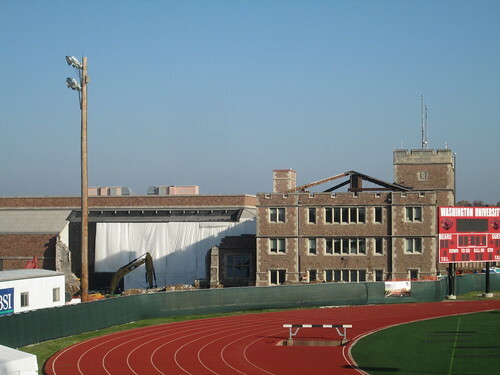 The detailed description of the project on the Campaign for Washington University site also alludes to a different outcome for the gym. 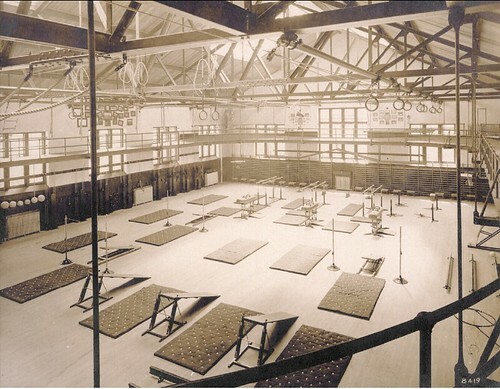 Boasting that the Francis Gymnasium and Francis Field are on the National Register of Historic Places and were the sites of the first Olympics in the Western Hemisphere, the article goes on to stat that the gym will be renovated into a state of the art fitness center. The rendering above is not so far off from this photo from the Missouri History Museum collection of the A. G. Spalding and Bros. Model Gymnasium, Physical Culture Exhibit at the Louisiana Purchase Exposition of 1904. 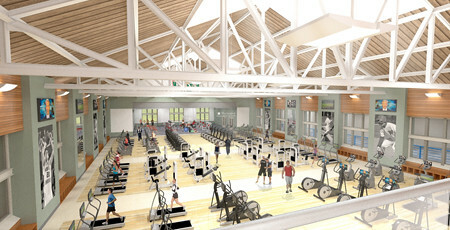 A story from Campus Life News from February of this year however states that the gym will be "replaced" with the new fitness center, locker rooms and multi-purpose rooms. 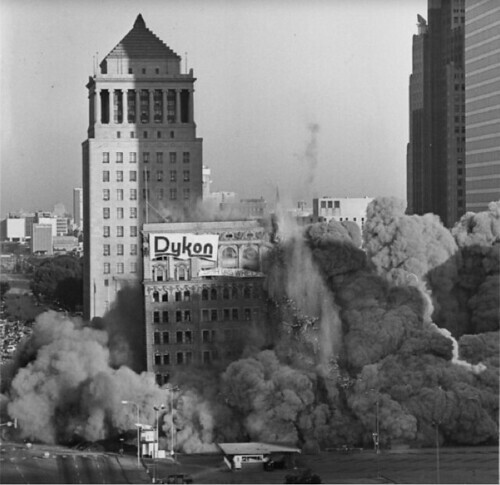 Thirty years ago today at 7:24 am the Buder and International Buildings, which were located on the block bounded by 7th, 8th, Market & Chestnut Streets, were imploded to make way for implementation of the Gateway "Half-Mall" plan. Today the block is occupied by the Gateway One Building on the north half and a plaza/park on the south half. The photo above is from the St. Louis Post-Dipatch archives. stltoday has a gallery of photos of the implosion and the buildings prior to demolition. For the history of the "Half-Mall" see http://preservationresearch.com/2012/01/the-evolution-of-the-gateway-mall-part-7-pride-and-the-mall/Part 7 of The Evolution of the Gateway Mall by Preservation Research Office. 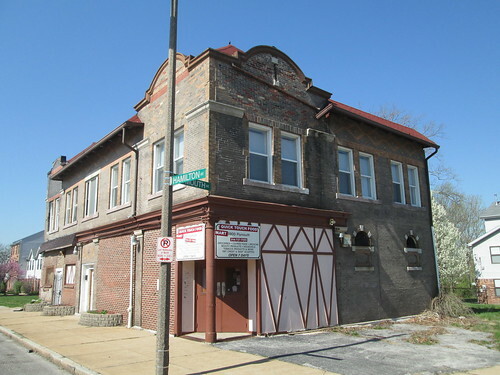 Friday NextSTL posted a great story about the recent rehabilitation of this building at the southeast corner of Clayton Avenue and Sarah Street. What struck me first was Alex Ihnen's initial take on the building prior to it's revival: "Won't survive the CORTEX onslaught, and no one will miss it". He's right. Over the years I've driven through that intersection maybe hundreds of times and the building never jumped out at me as anything too special. I'm glad to see it put back into use and with a surprisingly interesting interior transformation to boot. 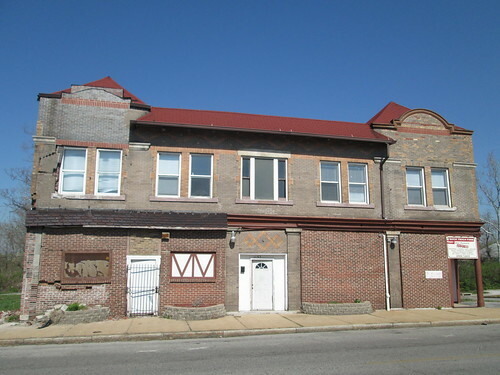 The story made me think about a few other buildings in the area that have disappeared in the last few years without much fanfare, such as this one at the northeast corner of Clayton Avenue and Newstead that was demolished in 2012. The building had a nice limestone entrance element and streamlined eyebrows over the windows, but not enough panache to stand out too much from others of its type and era. The location is not exactly an urban paradise surrounded by parking lots, a non-descript lab building and a 1-story former factory building. The site opposite on the southwest corner is now home to the soon to be completed Shriners Hospital, but the site plan for the new facility is a typical suburban disaster with the building pushed to the rear corner behind a parking lot so the building can become a billboard along the highway. Also pushed against the highway is the Stix Elementary School which was built on land BJC didn't want so they could put a garage on the site of the original 1921 Classical Revival Stix School on Euclid. 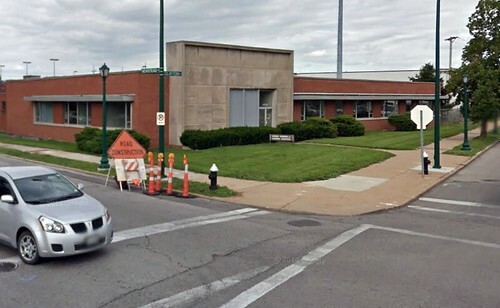 The location however is directly between BJC/WU Med and the center of CORTEX, one block from a future Metrolink station and close to Highway 40. All of this would make it a very attractive location for many companies, especially one that has graduated from a nearby biotech incubator and is looking for space of its own. City records show that BJC purchased the building and surrounding parking lot totaling 1.22 acres for $1.45 million in April 2010. 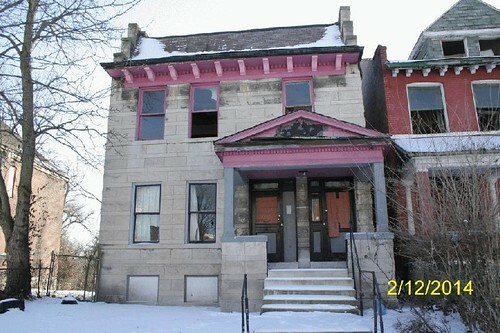 In December 2011, they applied for a permit to demolish the building, which was estimated to cost $68,000. Today the building site is a vacant plot of grass surrounded by a chain link fence. Certainly the one story building that was on this site is not the highest and best use for the property assuming the CORTEX district and BJC continue to expand. 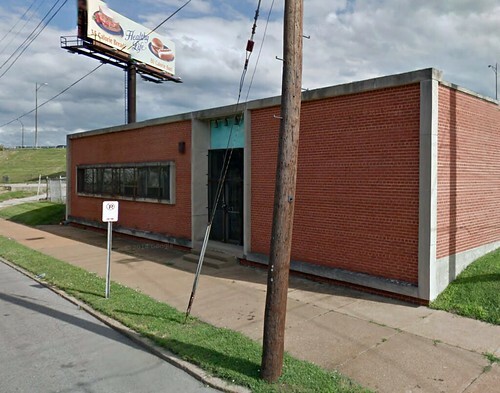 One has to wonder whether the building could have served an interim use as relatively inexpensive lease space for a growing company until the area surrounding area is built-out and its time to build a larger structure. 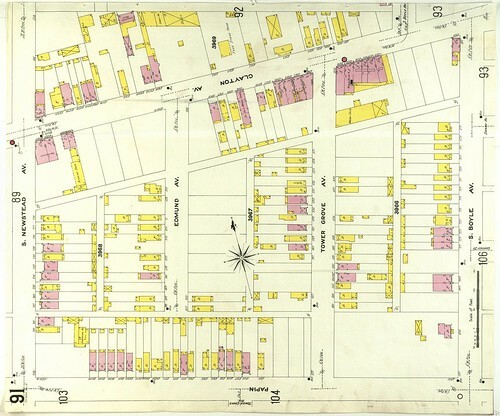 Curious about what was previously on the site before the modern era one story structure, I looked up the 1909 Sanborn map and was surprised to find that the area was a mix of small commercial and residential buildings, a majority of which were built of wood. Further east in the 4200 block of Duncan the demolition of this office and freight transfer facility probably dating from the 1920s has less to do with the building than what the CORTEX District will ultimately become. While the eastern office block portion of the building had some appealing aspects, it is safe to say that few saw a great loss when the building was demolished last year. 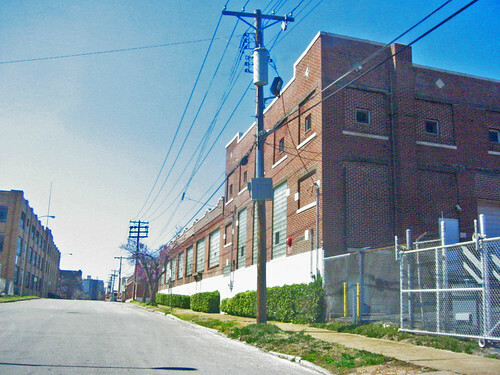 The building was located across the street and just east of the @4240 Building, the historic rehabilitation of the Western Electric - Southwestern Bell Telephone Distribution House, which has been a game changing project for the CORTEX District, proving that historic structures can be rehabilitated for new biotech uses and can become highly desirable. The project by Wexford Science & Technology has been very successful and has attracted among other tenants unexpected new branches of Boeing and Husch Blackwell. The photo above was taken shortly after the building complex across the street was demolished to make way for a large surface parking lot to serve the @4240 building. Beyond are two large structures fronting on Forest Park Boulevard that currently house storage units and a Salvation Army warehouse. Both are ripe for renewal. An aerial view of the new parking lot under construction last year in the top right corner of the image. The large white square in the middle is the @4240 Building, which has a smaller amount of surface parking wrapped around the east and south sides. The white rectangle in the bottom left corner is the also recently opened 220,000 s.f. BJC Commons office building that is surrounded on the north and east by a sea of asphalt stretching out of the image almost 750 feet all the way to Sarah Street. 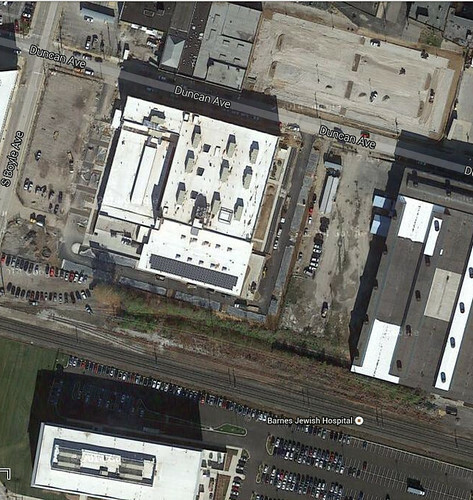 The proposed CORTEX Metrolink station will be located between the two buildings. In 2012 the architecture & planning firm Ayers Saint Gross was commissioned to do a master plan for the CORTEX District that showed parking confined to garages and buildings lining the streets forming an urban mixed use innovation district. CORTEX has grown exponentially in the last two years, but is starting to resemble a glorified office park rather than an urban mixed use district. 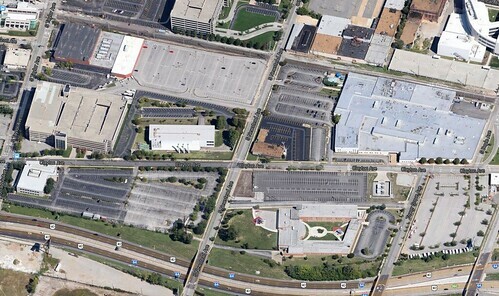 While the planned linear park is currently under construction, the idea of mixed use combined with retail has apparently been thrown out the window with the massive parking lot that will be built in front of IKEA. For CORTEX to achieve the vision of the master plan they will likely need to do a district wide taxing district to pay for the consolidation of parking and other improvements. 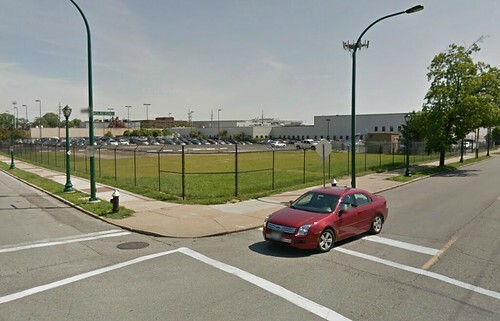 Hopefully this is in the works and I understand that these things have to come in phases, but for now, the urban plan views such as the one above are notably absent from the Master Plan page of the CORTEX District's website. Maybe like Peter La Fluer in Dodgeball they have found that if you set goals, you might get disappointed. 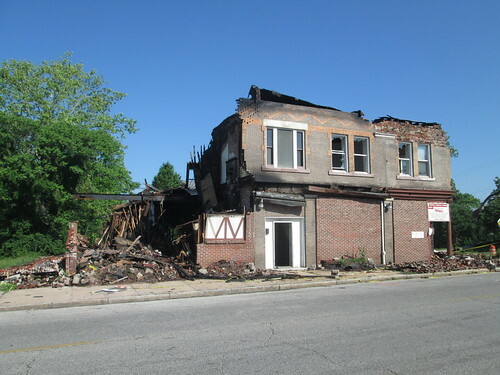 On June 1st I was on my way to photograph the Hempstead School at Minerva & Hamilton which had survived a fire the night before when I came upon this corner store and apartment building at Hamilton & Plymouth which had recently also suffered a fire with much more devastating results. The south half of the building had completely collapsed and the remaining portion standing lost its roof and was essentially gutted. 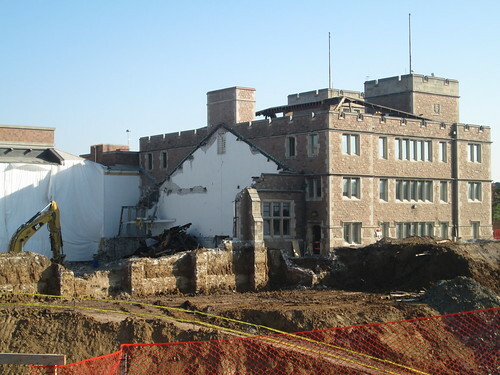 Before the fire, the building had some minor masonry issues at the southeast corner, and from studying the facade closely, it was apparent that brick work at both corners had already been re-built at least once. A close-up of the southeast corner shows some previous repair work failing possibly due to isolated differential settling of the foundation. A pre-fire view of the building from the corner of Pymouth & Hamiliton. Glimpses of vinyl siding on both sides show how most of the buildings original context had long ago been removed and replaced with more recent construction. Portions of this suburban style apartment complex occupies all three of the other corners of this intersection. 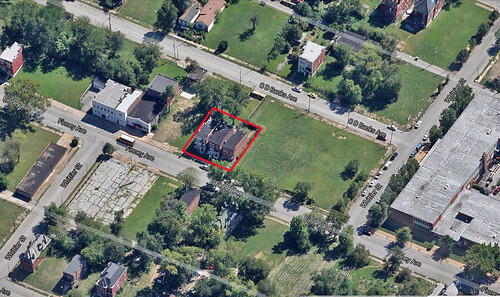 However just to the northwest across the street lies the Oakherst Place Concrete Block Historic District. 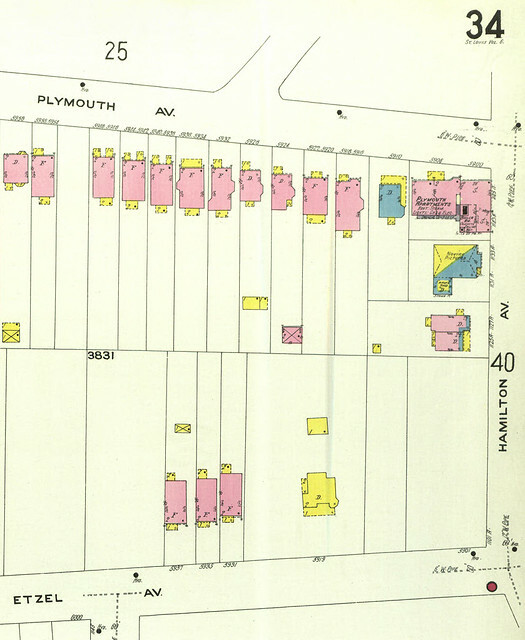 A 1909 Sanborn map of the corner reveals that what was left of this corner store building before the fire was only half of the original structure known as the Plymouth Apartments. More recently I was out on a morning run when I suddenly stopped cold at this sight on the south side of the 5800 block of Enright. 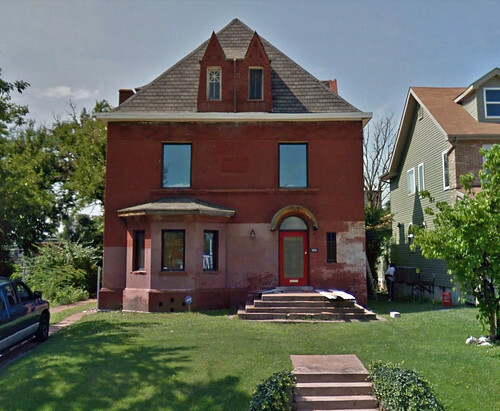 I instantly realized that the beautiful home at 5880 Enright in the photo below, which had also suffered a fire last year, was suddenly gone without a trace. 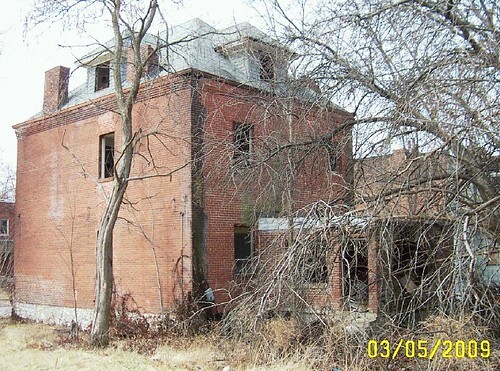 Photos above and below show the solid brick home with most windows intact on the fist floor, a side dormer window intact and the entire roof intact except for eave damage at the front and east sides. The dumpster in front of the house had seemed to indicate that damage inside the home was being cleaned out and that repairs would follow. Unfortunately repairs apparently never came and City records show that a demolition permit was issued on June 5th of this year. A view of the home before the fire. 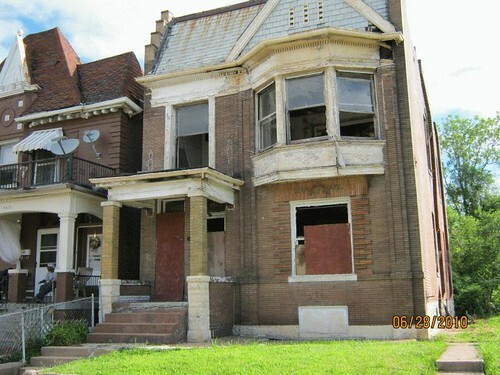 According to City records it was built in 1905 and was one of a handful of original houses left on this block that has mostly been re-built with new houses as part of the West End Estates development. Just 2 lots east of the recent demolition stands this house at 5770 Enright that has been vacant for about 2 years now and sits in a state of limbo. Hopefully it will not join the fate of its neighbor to the west. North Sarah Phase III to Include Demolition of Occupied Homes? 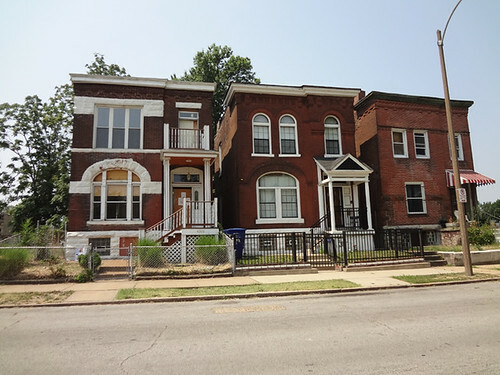 Last week a friend tipped me that the St. Louis Community Development Administration had posted a listing of funding awards from this years affordable housing applications. The list includes Phase III of McCormack Baron Salazar's highly successful North Sarah development. Phase III will contain 76 rental new construction rental units to be located on 39 parcels, which are listed by address. 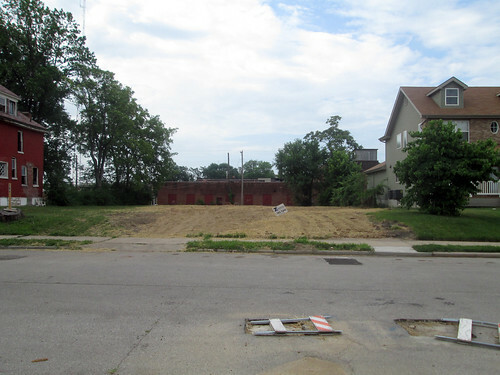 All but 3 parcels are currently vacant land, but parcels at 4208, 4010 and 4212 Finney Avenue are existing houses, two of which appear to be occupied, one recently occupied and all in very good condition. It would appear from the list, that these three houses pictured above, all of which are privately owned, are doomed to be bought out and demolished to make way for new construction. 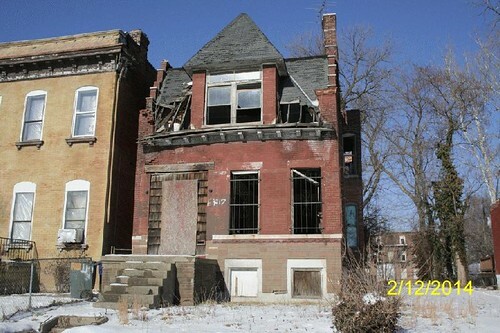 That such a thing could occur in a neighborhood that is both struggling to re-build from decades of neglect and abandonment and has a large amount of completely vacant land on which to build is both baffling and extremely frustrating. 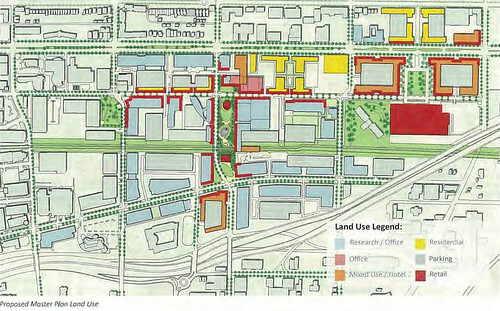 The map above shows portions of the existing North Sarah development (Phases I & II with larger buildings along Sarah Street) outlined in blue and planned Phase III shaded blue and red. The red is the three homes at 4208-12 Finney. The green shaded areas are the numerous vacant parcels in the immediate vicinity of the existing and planned North Sarah development that could be used instead of demolishing the existing houses. The area is just south of the much publicized 26 scattered site home demolitions. 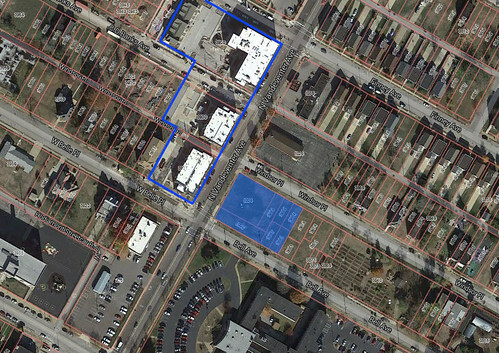 The North Sarah development has also built along the west side Vandeventer Avenue outlined in blue above with a planned expansion shaded in blue on the east side between Bell Avenue and Windsor Place. The area east of the planned expansion is a large community garden owned by Gateway Greening. An aerial view looking southeast of the homes on Finney showing a large available piece of land across C. D. Banks to the south (directly above the houses in the photo). The Kingsway Baptist Church at Finney and Wittier will apparently be spared. 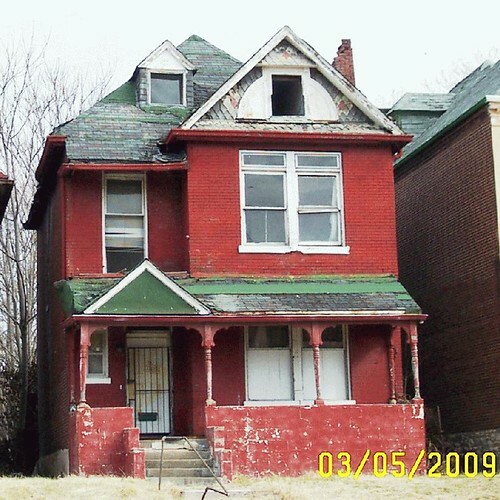 A photo of 4208 Finney in 2009 shows the home occupied and well cared for. 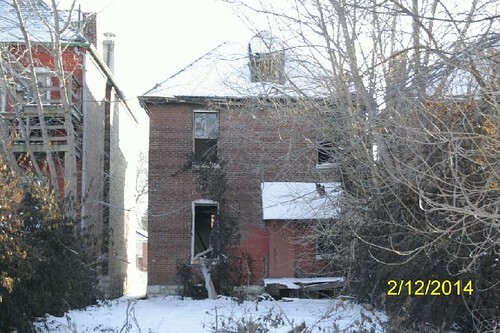 By 2013, 4208 Finney appears vacant but other than partially boarded, the home appears in good condition. 4210 in the center and 4212 at right both appear to be occupied and in very good condition as well. 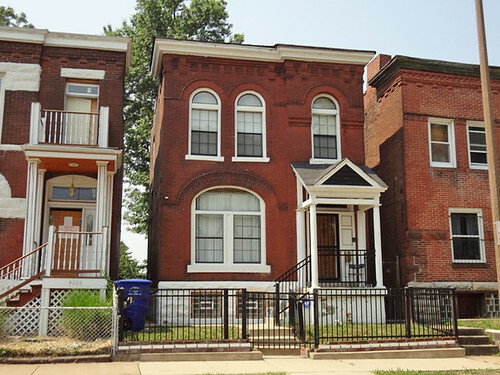 The three brick homes are an attractive group with almost identical massing but individual in detail. They were likely all constructed by the same builder. The first floor window of 4212 appears to have been altered at some point, but the alteration leaves the integrity of the house intact. 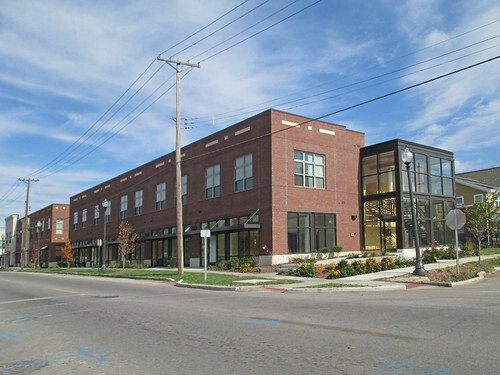 McCormack Baron Salazar's North Sarah development has thus far brought much needed life into the eastern blocks of the Vandeventer neighborhood including several live/work units included in the larger buildings along Sarah Street and Vandeventer Avenue. The architecture is a refreshing blend of contemporary and contextual that doesn't try to copy existing buildings but rather fits well as an addition of its time. Ironically, the middle building above has very similar massing to the three homes on Finney that appear to be marked for destruction for the next phase of development. With the amount of vacant land available for new construction in the area, it is inexcusable for new development to cannibalize existing stable homes and residents. The North Sarah development and Vandeventer neighborhood as a whole would be better off in the long run if the current plan could be changed to infill new development around the existing homes on Finney. 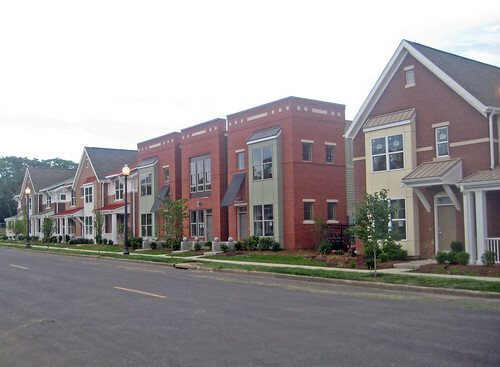 If St. Louis neighborhoods such as Vandeventer are to survive and thrive through the rest of this century, it will be through sustainable development practices that include both new infill and rehabilitation of existing buildings that give the place its unique character, not failed Modern era practices of total clearance for new build. 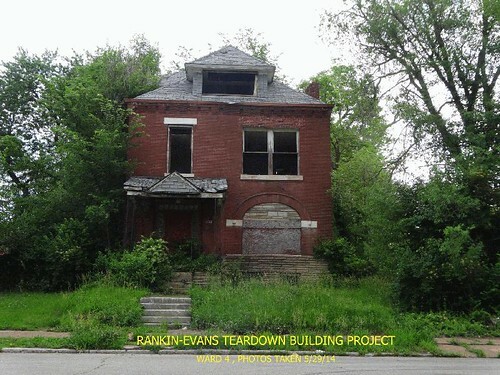 Recently, with much fanfare, the City of St. Louis announced that is is demolishing 26 buildings in the Vandeventer Neighborhood east of Ranken Technical College. The purpose of demolitions as stated in the Mayor's Office press release is to "reduce crime and prime the area for redevelopment". The first part of this reasoning, crime reduction, has seen arguments supporting the case that demolition reduces crime, as well as arguments that demolition doesn't reduce overall crime rates and simply displaces crime to other areas of a city. 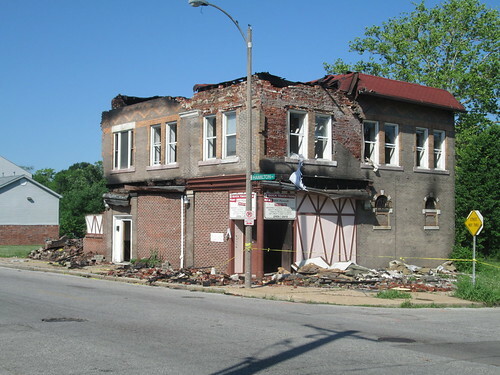 The second part of the reasoning for demolition however files in the face of almost every success story about the rejuvenation of neighborhoods in the City of St. Louis and elsewhere. 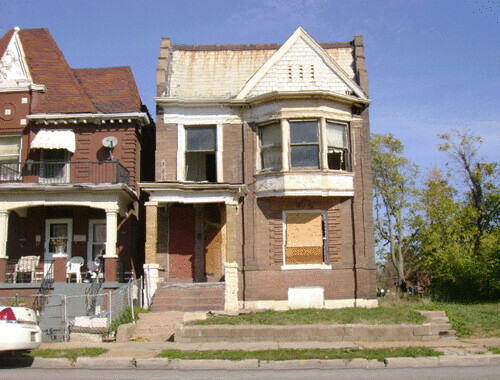 Rarely have mass demolitions resulted widespread and sustained resurgence of neighborhoods. 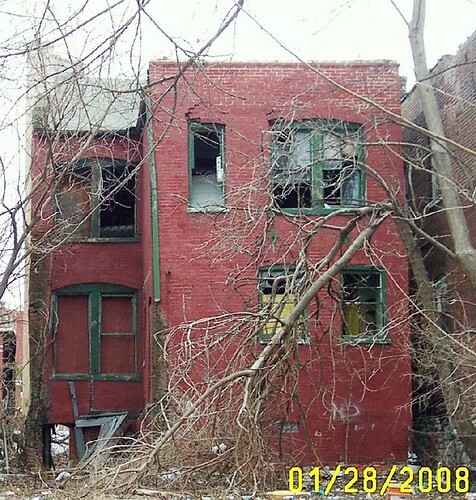 While there is a percentage of buildings coming down in this program that are less feasible to rehabilitate due to extreme deterioration, there are also many that could have been seen as assets to a reviving neighborhood and marketed for rehabilitation in an area the press release states is "ripe for reinvestment" due to proximity to strong anchors and areas of successful neighborhood resurgence. Nonetheless, with this project, any condemnation by the Building Department has assured destruction regardless of the overall condition of the building. 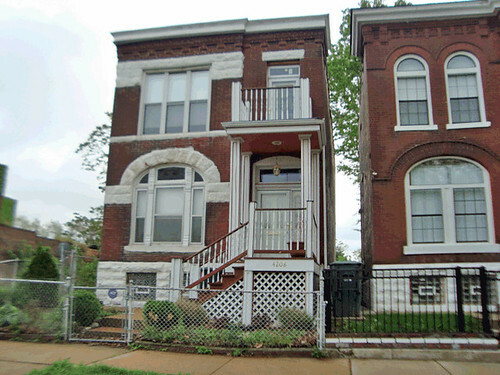 The home pictured above at 4201 W. Cook is one of these examples. 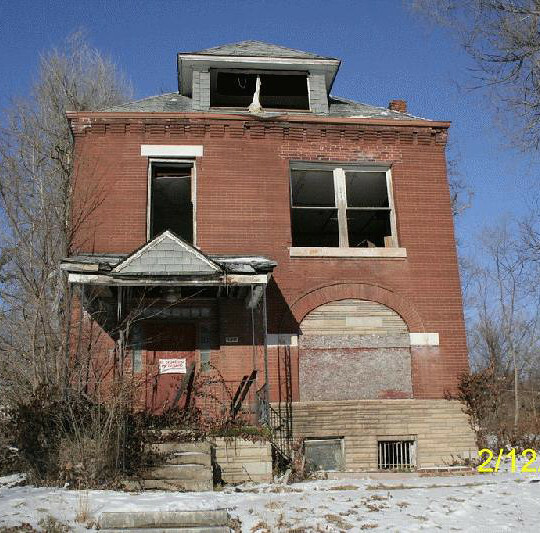 While obviously in need of work, the solid brick shell of this house has already seen some repair work and the roof appears solid. While the rear addition appears potentially sketchy, this could easily be removed leaving a solid home. Almost directly across the street this lovely stone front 2-family home at 4210 W. Cook that is being demolished as part of the project. 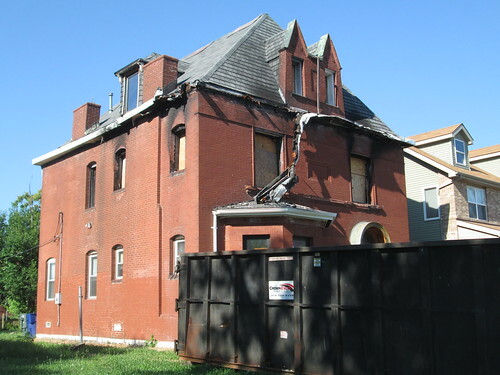 The home was likely condemned because it is missing a portion of its back wall, which is an all too common condition leading the demolition of otherwise very sound buildings. This occurs frequently due to theft of gutters and downspouts, leaving the back wall a virtual waterfall every time it rains, accelerating mortar deterioration. 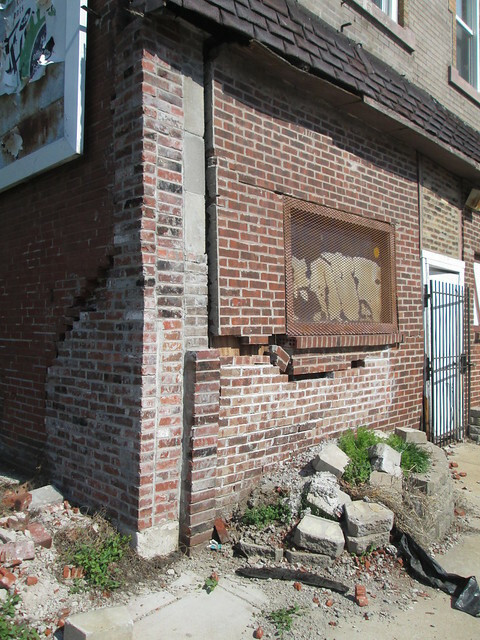 This is the reason that back wall re-construction is often a part of rehabilitation of a brick home. The stupid thing about condemning a building with this condition is that like this one, most seem to have floors and roofs that span side to side with a bearing wall in the middle. This means that barring a direct hit from a major wind gust, a backless building can stand for a very long time. 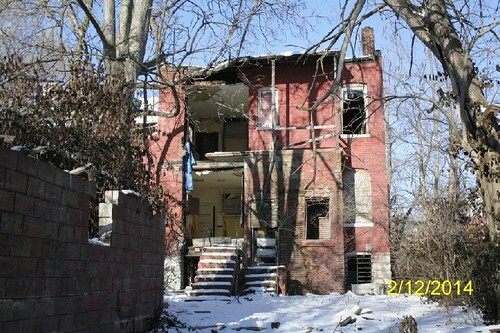 A 6-family in Skinker DeBaliviere stood in this condition for years. Next door at 4212 W. Cook is a very similar situation. 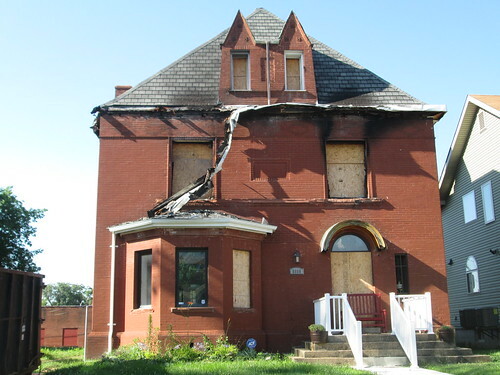 With this one, an isolated masonry failure over the front window is likely causing this house to be demolished. 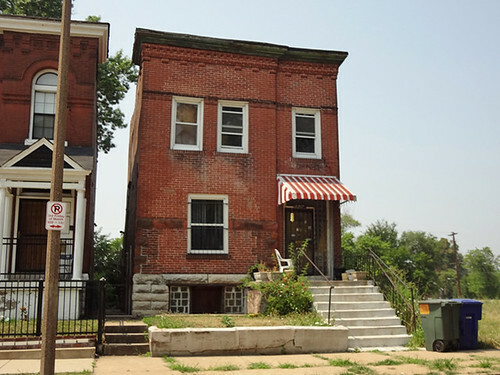 A photo of the rear shows this house fully intact while simply needing some tuckpointing over the 2nd floor windows. A block north on Page just east of Pendleton this pair of Queen Anne style homes are being demolished. 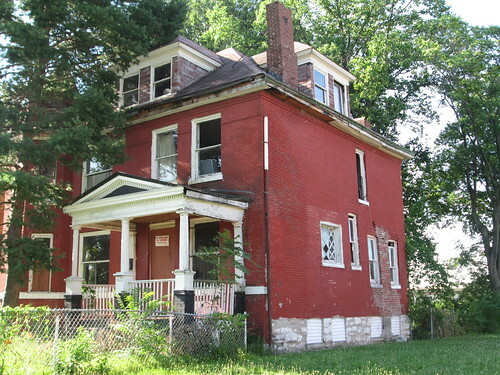 A block north of Page, this attractive 2-family house at 4425 Evans is being demolished. A closer photo reveals a highly articulated facade with detailed brick pilasters, raised quoins and a header with decorative garland all executed in Roman iron spot brick. Not to mention the decorative cornice and slate roof with a distinctive vent detail at the dormer. A side photo shows a small masonry failure over a basement window and some missing brick at the top of the stepped parapet. 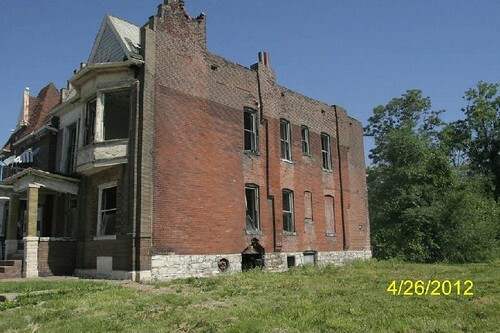 At the rear there is a wooden porch that is missing its 2nd floor and a few missing brick at the top of the wall. 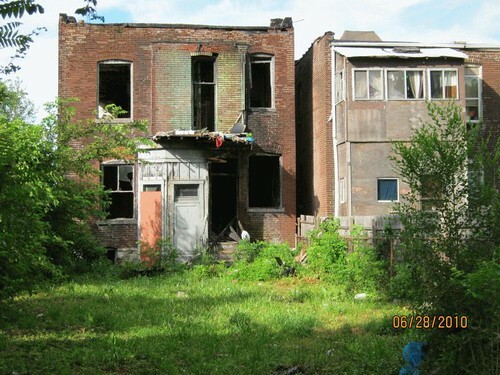 None of these conditions would hardly seem to be be cause for demolition. Further east on Evans is this two story home with very unique roof and dormer geometry as it appeared in 2007 and unfortunately below as it appears today. Unfortunately this house does have a partial roof collapse near the rear, which would have made rehabilitation more costly had this been even considered. The Mayor's press release states that of the 26 buildings, "none is historic nor in a historic district". If they are judging the term "historic" only by whether a building is located in a historic district, then they are correct. I prefer to believe that "historic" is a more relative term. 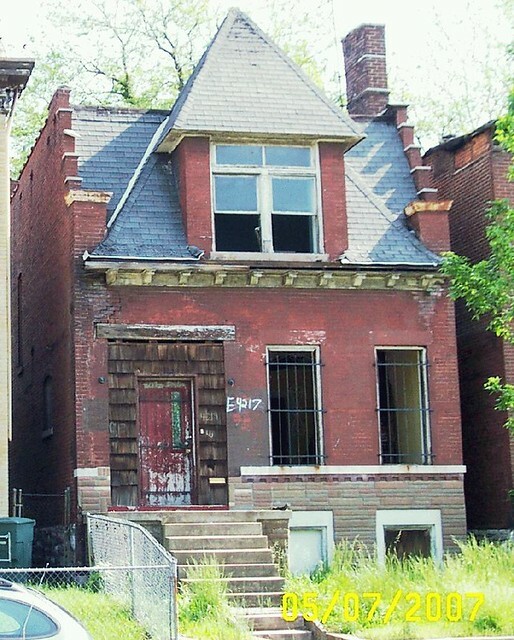 In the City of St. Louis, unfortunately, "historic" means that at some point the Ward Alderman agreed with someone's suggestion that a historic district should be created (or as fortunately has occurred in the 21st Ward, the Alderman steps up and makes this suggestion himself, knowing that designation can greatly help stabilize neighborhoods through incentivized rehabilitation). 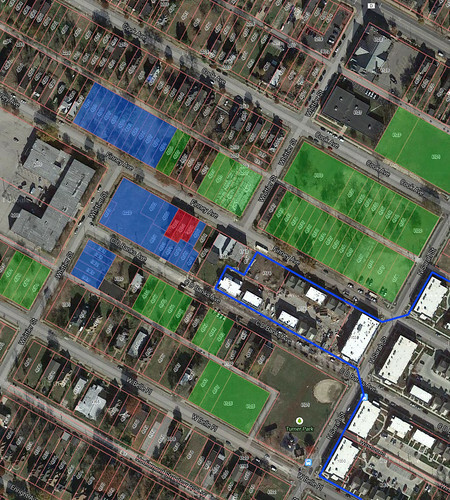 A map of the area showing the demolitions in red, Ranken Technical College outlined in blue and McCormack Baron Salazar's North Sarah development outlined in green. Just north of the area of demolition (outlined in purple), lies the lower blocks of the large Ville Historic District, (light purple shading) in the 4th Ward, which was expanded in 2006. 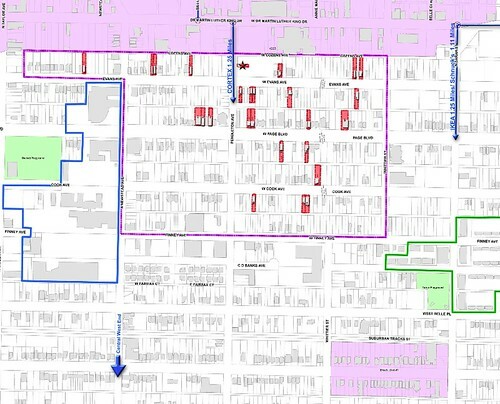 The lower half of the demolition area and most of the Vandeventer neighborhood is in the 18th Ward, whose Alderman Terry Kennedy has largely resisted creating or enlarging historic districts in the ward because he sees them as a burden to residents. 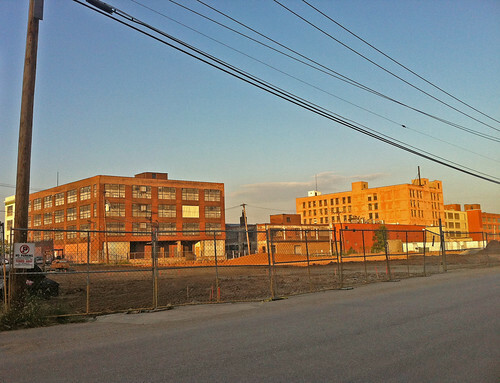 Meanwhile, much of the Vandeventer neighborhood has disintegrated. 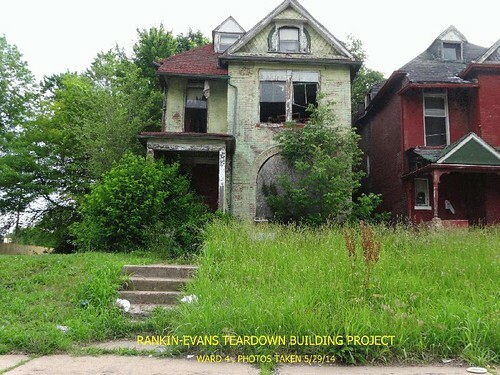 Could all of the homes presented here have been saved and have been financially feasible to rehabilitate? Probably not. Could and should have some of them been rehabilitated? Yes. 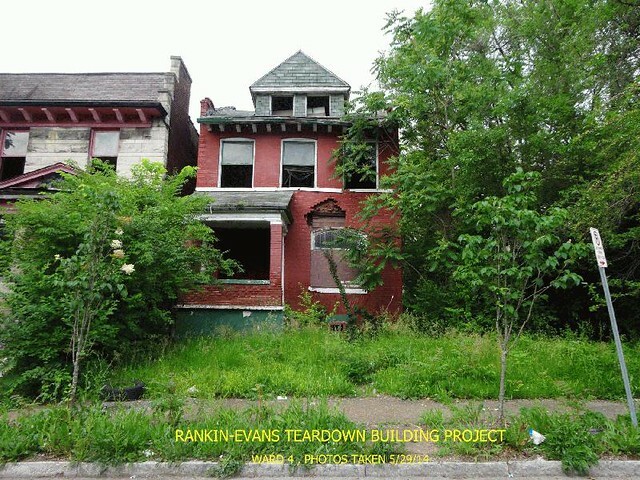 Can and should we as a City start to think smarter and creating better policies about levels of building condemnation, about what is repairable and able to be saved, about what should be stabilized and mothballed for rehabilitation and what should ultimately get demolished? Absolutely! !